The modes of communication changed with the invention of cell phone many years ago. However, as the ways of communication improved, cell phones also managed to bring in a number of applications that had a profound impact on the lifestyle of an average person. Today, Android and iPhones are all the rage and everyone aspires to hold one in their hand. These two devices are considered “trend-setters” for the fourth generation cell phone users. Many technology experts claim that iPhones are playing a major role in our lives and those who own it perhaps have the best broadband technological innovation in their hands. 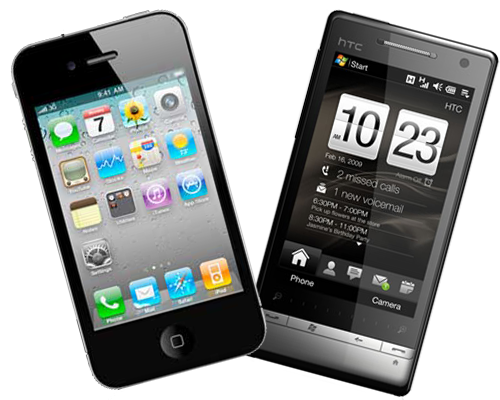 Android and iPhones ensure greater connectivity, is a step further by way of its advanced online options. iPhone users can constantly communicate with their friends and other contacts through social network and email. iPhones are known to offer the maximum level of connectivity compared to other communication devices. The accessibility of the iPhone works exceptionally well, whereas new information is processed and presented in the shortest span of time. It allows the users to access significant facts and stay updated round the clock. This means that you, as an iPhone user, can stay updated on stock market movements, train delay, weather forecast and everything else that matters you. iPhone’s benefits do not end here; there is a whole new lot of applications that users can purchase and download from the application store. These applications are not only useful for people who need organizational tools or information, but have also driven the businesses forward. The app store for the iPhone has enabled professionals to organize their calendars, tasks, and improve other forms of productivity. It has changed the conventional means of management as professionals can either establish processes for monitoring sales or collecting information on the market movement. On the other hand, Android has its own benefits too. Android features Google Voice just like the iPhone. Many users implicate that the experience of using Google Voice is extremely unique with Android instead of the iPhone because it integrates with the OS directly. When a user selects a contact from Google Maps or phone numbers in the browser, it works using Google Voice rather than connecting to an incorrect contact. Using Android Market, or even 3rd party best broadband websites such as AppBrain, you can easily search any application and just download it right away on your phone. Moreover, Flash is an important part of your phone that you cannot let go anyway. You will need it while using Flash websites like Kongregate. You will be able to access many things if you have Flash installed on your tablet or cell phone. There are many third party applications that offer you several advanced features on your Android phone. The best aspect about operating system is that users can utilize it, tweak over it, as well as installs their personalized version rather than the one that already comes with the phone. There is a limit to the amount of tweaks you can have on your Android no matter if it is interface-fixing MIUI ROM or CyanogenMod. Moreover, Android also gives the advantage to take off, swop and upgrade the SD card and memory. The above article is composed and edited by Sarah James. She is associated with many social media and technology communities and is a freelance writer and adviser. In her free time she writes articles related to cell phone reviews on Cell Phone Expert, internet technology, mobile internet, etc.